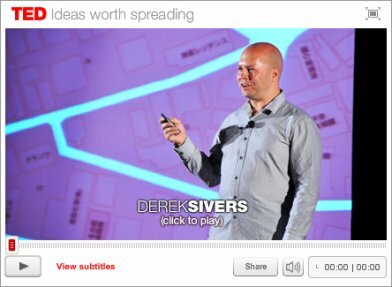 Derek Sivers (↑) is best known as the founder of CD Baby (↑). Do you remember the reasons why people do not buy from you? • They don’t want what you sell. • They don’t have the money. • They don’t trust you. Let’s focus on the first reason for a minute or two. They don’t want what you sell. Direct response copywriters and advertising experts taught us the importance of “getting into the head of our customer”. A piece of marketing which generates a lot of response is not a monologue, it’s a dialog between the copywriter and the reader—the prospect. A writer needs to join that conversation in the head of the reader. Therefore, the writer needs to understand the market and the prospects she is writing for very well. TED (↑) conference in India, in November last year. He reminds us of the many reasons why the person listening or reading might not understand what you are trying to communicate. His multicultural example makes it quite clear. That’s just the icing on the cake. Culture is not the only potential barrier that interferes with the meaning of your message and its perception. Enjoy the video and start becoming more aware of dangerous pitfalls in your communication and marketing. Posted by John W. Furst in Marketing, Top Posts, Video Series on Saturday, February 27, 2010 has got 2 Comments. I did not know there are no street names in Japan. A great example for the point Mr. Silvers is making. Every time I have to fill out an address form on the web I wonder about the fields and character limitations. Always have troubles to fit in my foreign address. I wish all TED videos were that short and to the point. LoL, I know exactly what you mean. (*) I never know in what US State I am living here in Spain. (*) ... or "/", etc. You are right about videos too. Too often the content of a 15 minute video doesn't contain more information than what you can fit on a single page which one could read in a glance or two.